Blink by Malcolm Gladwell: - Got this Book from Jitu . Though Jitu never loves to share his books, but this time. He did! . The best-selling author of The Tipping Point returns with a look at our ability as humans to make decisions, and the various factors that contribute to determine how quickly, and how well, each of us can make those decisions. But I found this book not as well as it was hyped! 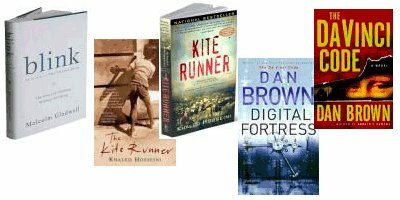 KITE RUNNER by Khaled Hosseini : Thanks to Pooja for referring this book . It was four days back when Pooja, Abhiram and Myself were talking on phone (Conference mode) and we discussed on some of the don’t-miss-it books. Its natural presence and depiction of human relationship makes a happy and nostalgic environment while reading. The first Afghani novel to be published in English, written by an Afghani physician and resident of California. Set against the backdrop of Afghanistan's recent turbulent history - this is the tale of two young boys and their fragile childhood friendship in Kabul. The Da Vinci Code : - While I was in bhubaneswar, my sister "Nicku" told me that the novel "Angel and demon" is a must read. And to my surprise its the prelude to "The Da Vincy code". So I set out a target n completed Angel and Demon while returning back in train from bhubaneswar to Mumbai. Four months later , I read "The DVC" . The Novel claims that Jesus and Mary Magdalene were married, that they had children, and that their descendants included a line of kings in France, as well as some of the main characters in Brown's novel. So popular has The Da Vinci Code become that it has created a marketing boom for books related to the novel, and it has become the subject of a major motion picture staring my favorite Hollywood actor TOM HANKS. Curent Song : " Look into my Eyes "